I just realized that my 2015-2016 Vancoupon book (a coupon book for Japanese-related things in Vancouver) was about to expire, so I made a plan to visit Guu Richmond for dinner and take advantage of their $5 off offer. Unfortunately, remembering to actually bring the coupon book with me was a task too difficult for my brain to handle. I then went online and searched for nearby alternatives in hopes of finding a cheaper place. 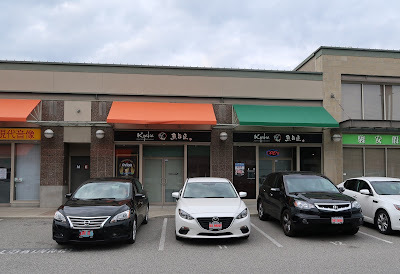 A picture of Aburi sushi from Kyabia Japanese Restaurant caught my attention, and I made my way there as quickly as a comet. 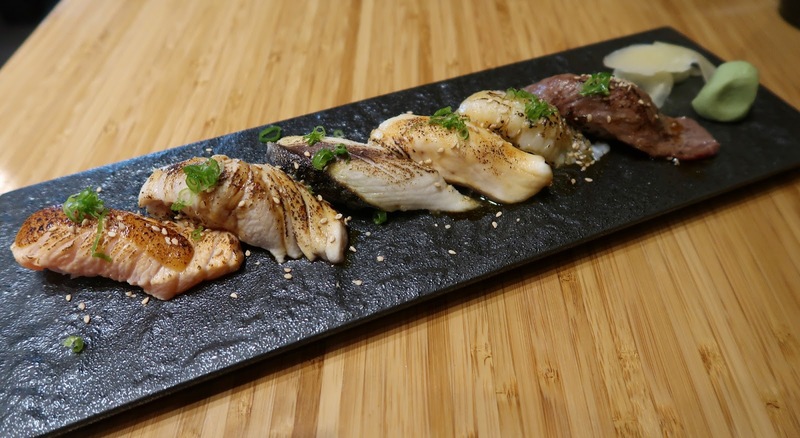 The Aburi Sushi Set ($26.95) was the first to arrive. I have no complaints about the sushi rice formation, but the rice itself could benefit from more flavour. The salmon was garnished with a creamy miso dressing and was soft and creamy. The toro had a lovely smoky flavour, although it was overdone at one end. The saba was slightly tough, but the hirame (flounder) was a nice recovery, being adequately juicy. The engawa (flounder fin) was the best of the set, though you have to be very careful while eating it due to its highly delicate texture. Finally, the Kobe beef was a bit lacking in flavour and was not particularly soft. Overall, the set was well-prepared and the textures for the most part were excellent. However, at $26.95, I found it overly pricey, as you can get more pieces of Aburi sushi at Miku for a lower price. 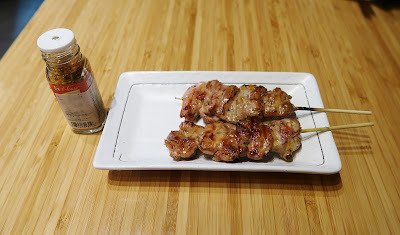 The next dish to arrive was the Yakitori, which came with meaty and tender chicken. There was just the right amount of sauce and moisture in the chicken. Best of all, these are quite affordable compared to many of the other things on the menu. 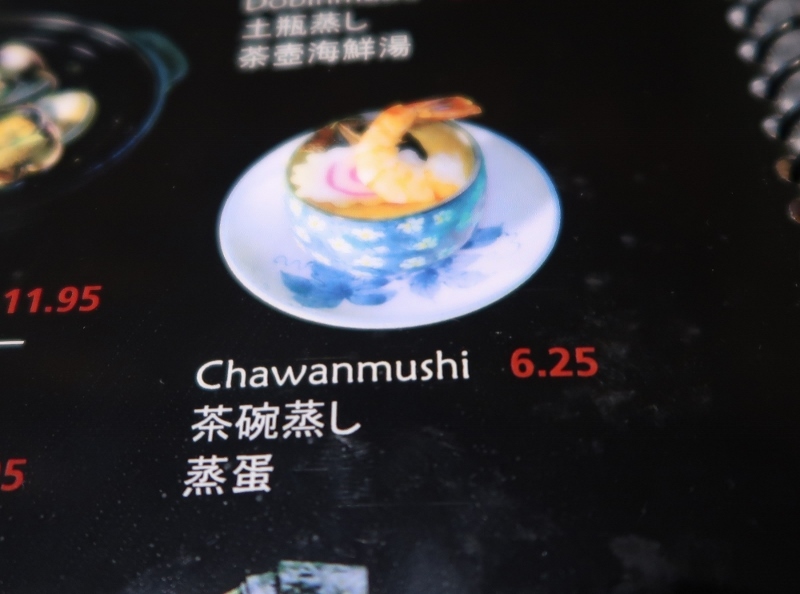 I ordered the Chawanmushi mainly because of how good it looked on the menu (see here), so I was slightly taken aback by the plainness of the Chawanmushi's real form. 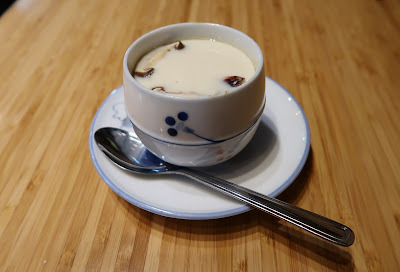 It was served hot, and the egg custard absorbed the flavour of the mushrooms on top. In addition to the mushrooms, I managed to dig out a piece of narutomaki, a small imitation crab stick, and some shrimp. Overall, I didn't find any real flaws with this Chawanmushi, yet it lacks the wow factor of the one I had at Yuji's from Japan. When I saw the Unagi Puff ($12.95) on the specials menu, I had no idea what it was, so I ordered it out of curiosity. For all I knew, I could have received a Beard Papa's cream puff with unagi stuffed inside it instead of cream filling, or perhaps even unagi with extra air injected into it to make it puffier... who knows? Much to my surprise, the Unagi Puff came as three pastries with unagi in it. 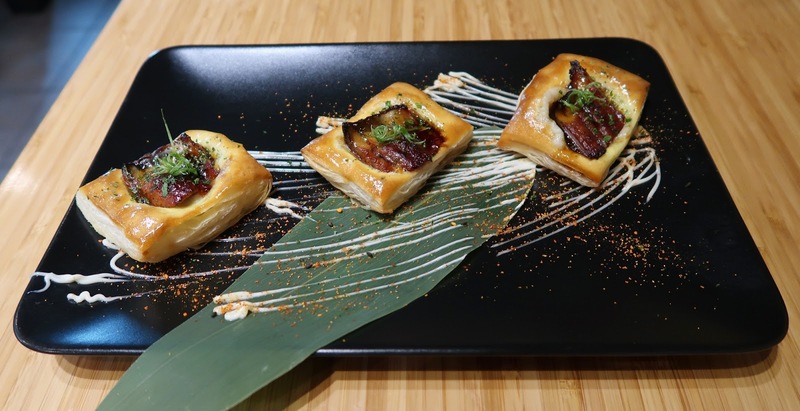 The unagi was certainly well-prepared, but its flavour was lost to the creamy, quiche-like filling of the pastry. I didn't know whether to interpret this as a very tasty pastry or a botched unagi dish. 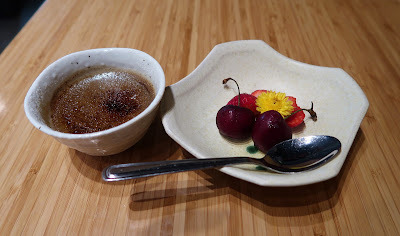 For dessert, I had the Black Sesame Crème Brûlée, which came with soft, creamy custard and a fine layer of hard caramel. I enjoyed the properly executed crème brûlée, although it would be even better if it came with a sweeter choice of fruits that matched the sweet black sesame flavour of the custard. The service at Kyabia was friendly and overall decent, though it could improve in terms of attentiveness. It is evident that the chefs spent a lot of time trying to perfect the execution of the menu items. The food was consistently well-executed with just a few minor flaws. Unfortunately, my bill surpassed $60 (before tips), which is a little more than what I would like to pay for a sushi adventure. And yes, I wasn't even full. If the food were about two-thirds the price, I would easily recommend Kyabia as a go-to place for Japanese food in Richmond. Yep, they only open for dinner!